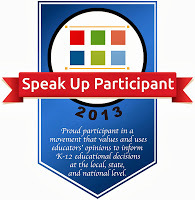 [NHDOE-ETNews] ET News: SpeakUp Surveys Close on December 20. The time to Speak Up is now! ITEM: SpeakUp Surveys Close on December 20. The time to Speak Up is now! [http://nhoetnews.files.wordpress.com/2013/10/6174c-su_badge_hires.jpg]Surveys close next Friday, December 20th! Thank you to all the participants that have already taken part in the Speak Up surveys! Since the launch of the survey over 240,000 Students, Educators, Parents and Community Members have shared their ideas about the use of technology in education. Be sure to take the survey<https://go.madmimi.com/redirects/1386607339-2ce9a1022471d1e37d8eff19a0e7d1c8-f003c07?pa=18917161606> today and pass along to your network of friends and family, remember the survey is open to ANYONE interested in sharing their thoughts on critical 21st century education and technology issues. §  ■ Last minute Promotional Ideas There's still plenty of time to get involved in Speak Up, find new ideas here. §  ■ New to Speak Up, watch our 45 minute introductory webinar! Learn how you too could get a free webinar with CEO Julie Evans next school year! §  ■ Help us reach 1,500 community member surveys! You don’t have to be an educator or student to take the survey. The voices of your community members are important too! Happy Reading! Feel free to share your thoughts with us on Facebook<https://go.madmimi.com/redirects/1386607339-9b696aab037bd4a43aea50879e962da8-f003c07?pa=18917161606>, Twitter<https://go.madmimi.com/redirects/1386607339-b9c2f9413a2bbedcf0a0e16e7790f00d-f003c07?pa=18917161606> and our Blog<https://go.madmimi.com/redirects/1386607339-9a2beb03e82c229a7024b75fbd94e671-f003c07?pa=18917161606>.